Can burping be caused by acid reflux? Prior to discussing the connection between the two, let's briefly go over the immediate physiological causes of acid reflux. Acid reflux is the backward flow of stomach acid into the esophagus. The stomach is lined with a layer of mucus to protect it from the corrosive action of the acid, but the esophagus is extremely sensitive and repeated events can eventually corrode the esophageal lining. The main symptom of acid reflux is heartburn but it may also cause coughing and a feeling of something stuck in the throat as well as burping. Burping or eructation with acid reflux is often accompanied by a typical sound and often a bad odor and can therefore be an annoying symptom and in social situations downright embarrassing. However, in some cultures, a loud belch shows appreciation for the meal. Babies are particularly susceptible to accumulation of gas in the stomach while feeding and need to be burped to expel the gas to avoid discomfort. Babies on formula are more prone to gas than those who are breastfed. It is important to recognize burping as being associated with acid reflux and know the treatment options available. It is also important to understand that burping is a common occurrence for most individuals. The act of sipping, gulping and sucking can introduce more air into the stomach. The gas in the stomach can also be caused during digestion of food in the stomach and small intestines. Interestingly, since a burp occurs when the pressure in the stomach exceeds the pressure in the lower esophageal sphincter, burping is actually more likely to cause acid reflux rather than ease it. But a school of thought believes that burping actually relieves the pressure in the stomach that is felt when experiencing heartburn. A fairly simple way to bring up a burp is to drink some ginger ale. 1) Eat smaller frequent meals rather than few large ones. Overeating can bring about stomach discomfort and often triggers burping. 2) Eat slowly with mouth closed to avoid swallowing a lot of air. 3) Avoid carbonated, alcoholic, and caffeinated beverages. 4) Avoid foods like onions, cabbages, mint, onions, spicy and fatty foods, and chocolates. 5) Stress reduction and relaxation also help in decreasing belching. 7) Reduce weight if necessary. 8) Stay away from daily use of antacids. 9) Maintain a diary noting down the time when burping occurs and the foods eaten. Excessive burping may be an indicator of acid reflux. Acid blockers and antacids are only a short-term cure and usually cause serious side effects when used for prolonged period of time. 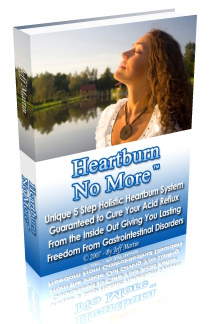 A holistic approach to curing acid reflux is the only permanent and safe solution. The above suggestions incorporated as lifestyle changes will not only help cure acid reflux but improve overall health.